Coming to Club Bonafide on December 2! 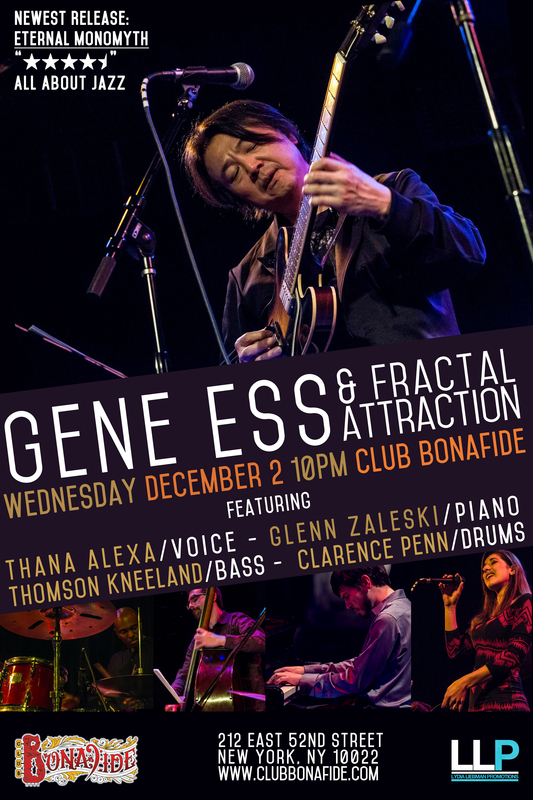 Gene Ess featuring Thana Alexa, Glenn Zaleski, Thomson Kneeland, and Clarence Penn! Fresh off the heels of their latest release, Eternal Monomyth, Gene Ess and Fractal Attraction have been solidifying themselves as one of New York’s premiere collectives featuring original material that explores the use of the voice as an instrument in a chamber group setting. Eternal Monomyth is the riveting companion piece to Fractal Attraction, which was the winner of the SESAC Outstanding Jazz Award in 2013 and peaked at number 3 on the jazz radio charts. The diverse background of award winning guitarist Gene Ess has had a profound effect on creating his unique style. Gene’s musical background began with the study of classical piano with a focus on the works of Beethoven and Chopin. Though Gene is originally from Tokyo, Japan, he grew up on a United States Air Force Base on Okinawa. This experience led him to be exposed to a mix of cultural influences ranging from indigenous music of Okinawa to the pop and jazz music that flowed from the clubs that catered to American soldiers. Through the 1990’s, Gene recorded and toured globally with the prolific drummer Rashied Ali (known for his association with saxophonist John Coltrane). In 2002, The Rashied Ali Quintet released “No One In Particular,” which was co-produced by Gene and well received by critics. Carlos Santana, Archie Shepp, Matt Garrison, Reggie Workman, Ravi Coltrane and Dave Liebman are just some of the important jazz figureheads Gene has shared the stage with.